In a society that progressed as rapidly as did Japan during the post-war period, films from the 1950s and early 1960s like those of Yasujiro Ozu preserve a point in time as it mostly was rather than how it is now remembered. At the time, Hollywood produced some fine films in and about Japan too. Shot on location, a movie like House of Bamboo (with Robert Stack) captures the Tokyo cityscape before modernity swept that sepia-colored world away. Equally deserving of attention are those entertainment vehicles that won little in the way of high-culture respect (and even less in terms of international attention), and yet created the tropes and types of popular culture that still resonate today. Unlike the works of Yasujiro Ozu or Akira Kurosawa (such as High and Low, his 1963 police procedural), these movies have little value as artistic or as historical documents that strove for verisimilitude. But they have great value as records of how the general public perceived the world around them, the ways in which they were willing to suspend their disbelief in order to imagine that social change in entertaining ways (still true of manga and anime today). A great example of this is the clumsily titled (in English) Detective Bureau 2-3: Go to Hell Bastards! released by Nikkatsu Studios in January 1963. 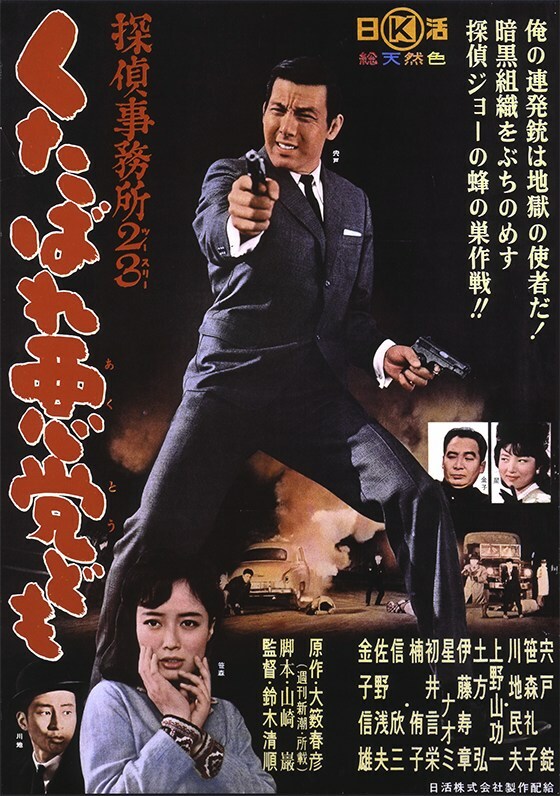 The bad boy of the post-war Japanese movie business, Nikkatsu Studio avoided historical dramas and concentrated on low-budget comedies, teen melodramas, and actioners. Losing ground to television in the 1970s, Nikkatsu became synonymous with the "pink" genre. 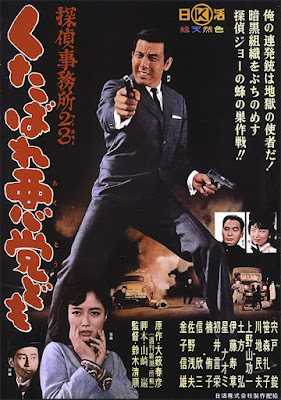 But in 1963, though chock-a-block with armies of gun-wielding yakuza and a sky-high body count, Detective Bureau 2-3 (the "2-3" refers to protagonist's office number) isn't any more violent or explicit than Hollywood westerns of the 1950s. Director Seijun Suzuki gives the film the look of a classic noir thriller. Joe Shishido (who appeared in six of Suzuki's films) is perfectly cast as a debonair detective who infiltrates the yakuza to expose a gun-running operation. Featuring a sports car (that looks cool today), beautiful women, and heavies that could pass for Edward G. Robinson's cousins, plus the inventive use of what were then high-tech devices, Detective Bureau 2-3 had Miami Vice and Don Johnson beat by two decades. Speaking of which, Miami Vice did an episode about the yakuza that wasn't half bad. But Don Johnson never wriggled out of tight situation with a song-and-dance routine that Fred Astaire could have choreographed. Suzuki later got himself fired from Nikkatsu for making films that were so surreal and absurdist that they alienated Nikkatsu's core audience. When you're in the crowd-pleasing business, you do have to please the crowds. In Detective Bureau 2-3 Suzuki and Shishido get the mix just right. Sporting a plot worthy of Chandler, it skirts the nihilism that came to typify the yakuza genre and supplies an upbeat ending. More upbeat than how the real world was dealing with the issue. House theft was rampant, narcotics use was endemic, and it was considered too dangerous to walk in public parks at night. Moreover, yakuza were everywhere, their numbers at an all-time high. There were also twice as many places to eat as New York and more bars per square kilometer than anywhere else in the world. The 1964 Olympics initiated a crackdown that was more of an accommodation. It essentially decriminalized the yakuza. Unlike American gangsters, the big yakuza organizations are legal corporations, and the police prefer to regulate them as such. Sort of the same argument for decriminalizing drugs: stay away from the hard stuff and don't shoot civilians and we won't look too closely at where the hard cash is really coming from. Capturing the yakuza sub-culture at its apex, Detective Bureau 2-3 makes hanging with the bad guys look cool. And the bad guys look cruel but cool. As with the glamour of the Miami Vice underworld, this comic book view of the yakuza persists to this day.